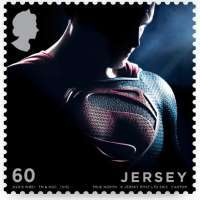 The Jersey Post has revealed a set of Super Stamps ahead of the release of the latest Superman film, Man of Steel, which stars Henry Cavill who comes from Jersey. 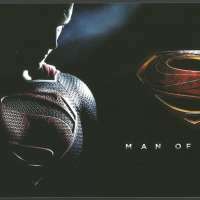 The first stamp - 45p features a close up of Cavill, when scanned with a smart phone triggers an augmented reality app through Smartsy (which was also designed and developed by True North) which leads the user to the trailer and images of the film. The second stamp is transparent stamp - 55p. 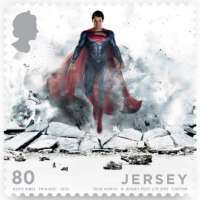 The image of Man of Steel in a dramatic mid-air flying pose is set on a transparent stamp, to symbolise his x-ray vision. 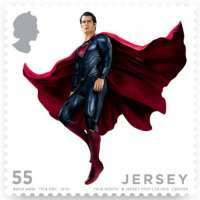 The third stamp - 60p with Simili silver foiling creating a Hologram effect, reflecting the Man of Steel incredible strength. 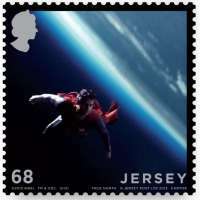 The fourth stamp - 68p, a Heat Sensitive stamp is printed with monochromic ink, which when warmed reveals the earth behind Superman. 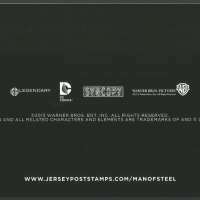 The fifth stamp - 80p, features a thermographic stamp with crushed granite from Beauport Bay (which is Cavill’s favourite spot in Jersey) applied to give a rough tactile finish to the stamp which acknowlegdges the Man of Steel's strength. 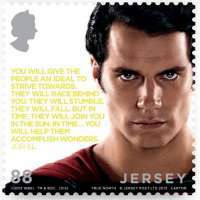 The sixth stamp - 88p, features a hidden message from Superman's father Jor-El which is visible only in the dark (glow in dark invisible ink used). 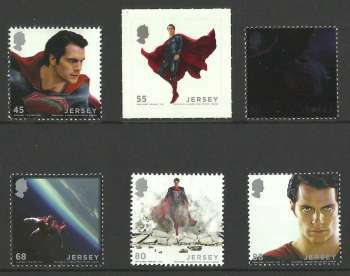 The miniature sheet - £3 features a lenticular stamp which when tilted shows the Man of Steel flying across the stamp. True North worked closely with Cartor Security Printing to develop the print techniques as each stamp uses a different finish or feature. Sally Diamond, Head of Philatelic at Jersey Post said: "This is an incredibly exciting day for Jersey Post. We have produced a stunning set of stamps, which were inspired not only by a momentous cinematic occasion but also by the talent that this small island is capable of producing." It was the first time Jersey Post had issued stamps for a Hollywood film. She said the project had taken two years after approval from Henry Cavill's team and Warner Brothers. The stamps received Royal approval this month. 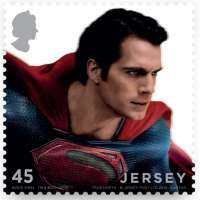 Henry's father Colin Cavill said: "Henry is very proud of his island roots and has been involved in the development of the stamps throughout." Gary Caroll, business development director at Jersey Post said: "We hope that islanders will want to buy these products, not just for their collectible value, but also because they reflect another proud moment in Jersey's cultural heritage. Henry Cavill is not only a superhero, he is our local hero and we are delighted to mark his achievement in this way." The new son of Krypton is, in reality, a son of the Bailiwick of Jersey. Henry William Dalgliesh Cavill was born 5 May 1983, the second youngest of five boys to mother, Marianne and father, Colin. He attended St Michael’s Preparatory School, in the parish of St Saviour to the east of the island, and became Head Boy in his final year. St Michael’s is also renowned for its excellent sports facilities and achievements which may go some way to explain the origins of the Man of Steel’s imposing physique. Though, in truth, some credit must go to the super-strict work-out regime and six-month high calorie diet (including two months on an impressive 5000 calories a day) drawn up by the trainers at Gym Jones who got Henry into shape for the role. Zack Snyder’s behind-the-scenes team includes director of photography Amir Mokri (“Transformers: Dark of the Moon”); production designer Alex McDowell (“Watchmen”); editor David Brenner (“Pirates of the Caribbean: On Stranger Tides”); and multiple Academy Award®-winning costume designer James Acheson (“Restoration,” the “Spider-Man” films) and costume designer Michael Wilkinson (“The Twilight Saga: Breaking Dawn – Part 1 and 2,” “Watchmen,” “300”). The music is by Academy Award®-winning composer Hans Zimmer (“The Lion King,” “Inception”).